There are several different types of surgery that may be done for lung cancer that vary in the amount of lung tissue removed. Wedge resections remove the least tissue, whereas a pneumonectomy involves removal of an entire lung, with segmental resections and lobectomies lying between these two. Methods of surgery can vary as well. Open surgery (thoracotomy) involves a large incision, whereas minimally invasive procedures such as video-assisted thoracoscopic surgery (VATS) are done with instruments through small incisions in the chest. There are also alternatives to lung cancer surgery that may be appropriate for some tumors, such as stereotactic body radiotherapy (SBRT), and radiofrequency ablation (RFA). Learn about these different approaches, and why one procedure may be preferred over another. There are a number of factors that doctors consider before recommending lung cancer surgery. 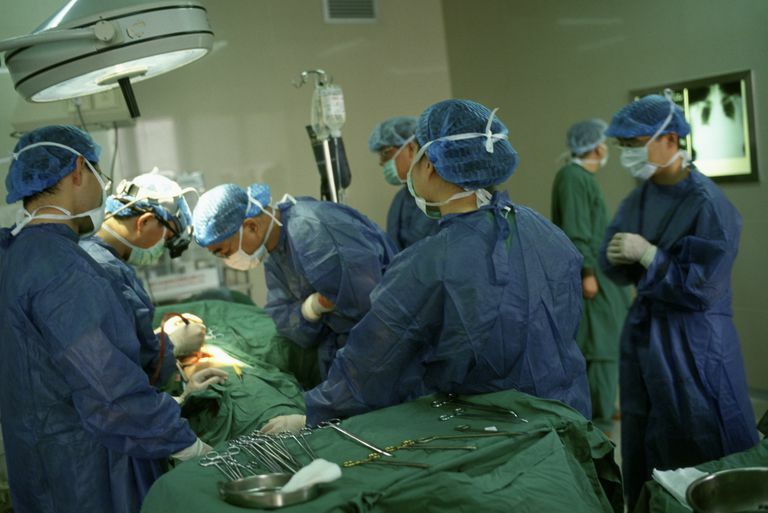 Surgery may be considered for stage I, stage II, and stage IIIA non-small cell lung cancer. Surgery for small cell lung cancer is done infrequently, and is usually reserved for very early limited-stage cancers. For non-small cell lung cancers that are stage IIIB or stage IV, as well as most small cell lung cancers, chemotherapy, radiation, targeted therapies, or immunotherapy are usually better choices. The size of your tumor. Whether or not your tumor has spread to nearby tissues. How well your lungs are functioning prior to surgery. In the past, the general thought was to remove a larger amount of lung tissue to reduce the chance of recurrence. More recent studies, however, have found that the different procedures are often comparable in terms of survival advantage and quality of life after lung cancer surgery. There are four primary types of lung cancer surgery, though variations on these procedures may be recommended based on your individual situation. A wedge resection removes the portion of the lung that includes the tumor, and some surrounding tissue. It is most commonly done when a tumor is caught very early, or if surgery that is more extensive would interfere too much with breathing. The chance that a cancer will return after this type of surgery is somewhat higher than with the other types of surgery. In a segmental resection, a larger piece of tissue is removed than with a wedge resection, but less than an entire lobe. In this procedure, a surgeon may remove one or more segments of a lobe of a lung. Together, wedge resections and segmental resections may also be referred to as sublobar resections, referring to the removal of less than a complete lobe of lung tissue. A lobectomy involves the removal of a lobe of the lungs, with a bi-lobectomy referring to the removal of 2 lobes. The right lung has 3 lobes and the left lung has 2 lobes. This is the most common surgical procedure done to treat lung cancer. A pneumonectomy involves the removal of an entire lung, and can result in a significant loss of lung function. Despite this, many individuals with good lung function prior to surgery tolerate living with one lung quite well. A pneumonectomy is considered if a tumor is too large to be removed by the other methods available, or if the tumor is located in a more central location in the lung. A sleeve resection involves removal of part of a bronchus along with lung tissue, and is analogous to removing part of a sleeve of a shirt (and part of the body of the shirt) and then joining the portions of the sleeve above and below the removed section back together. It is often done as an alternative to pneumonectomy for central tumors that are growing into a bronchi (to avoid removal of an entire lung). A unilateral or bilateral lung transplant for lung cancer, is rarely done, with the major reason being that many lung cancers have spread beyond the lungs at the time of diagnosis. This procedure may be considered for some select people with a form of lung cancer formerly known as BAC or bronchioloalveolar carcinoma (that has now been renamed as a form of lung adenocarcinoma), or for a very early lung cancer combined with end-stage lung disease such as COPD. The methods by which lung cancer surgery is performed can also vary, from open surgery to robotic surgery. In a thoracotomy, a large incision is made along the chest, and ribs are spread apart to obtain access to a tumor. This is the traditional form of surgery done for lung cancer. A type of minimally invasive surgery called video-assisted thoracoscopic surgery, or VATS, is now being done much more frequently to remove lung tumors. It is also sometimes referred to as "keyhole surgery." In this procedure, several small incisions are made in the chest through which instruments are inserted. These instruments are used to excise lung tissue, which is then removed through the small incisions. VATS is usually associated with shorter recovery times and less post-operative pain, but cannot be done for all lung cancers. Since there is a learning curve with this type of surgery, it's important to find a surgeon who performs many of these procedures each year. Robotic-assisted thoracoscopic surgery (RATS), another type of minimally invasive surgery, is similar to VATS, but the surgery is performed robotically. RATS is relatively new, and is not available at all cancer centers. As with VATS, there are situations in which an open thoracotomy may be preferable due to the location of a tumor. Most often, lung cancer surgery offers the best chance for a cure. Yet for some people who have early stage lung cancer which is not operable, or for those who would not do well with surgery do to the presence of other conditions, there are other options. Stereotactic body radiotherapy (SBRT) is a radiation procedure in which high doses of radiation are delivered to a small area of tissue, and may be used as an alternative to surgery for some early stage lung cancers. Proton beam therapy for lung cancer is similar to conventional radiation therapy, with the exception that protons are used instead of photons or X-rays to create tissue damage. This treatment can deliver high doses of radiation to precise areas of tissue, and may be considered as a curative approach for some very early stage lung cancers. Both SBRT and proton therapy may be used for small tumors that are in vital regions that would make surgery dangerous. Radiofrequency ablation used techinques such as microwaves to destroy cancerous tissue in the lungs. Newer techniques that can be used in smaller airways are now being studied as well. The best type of surgery, method of surgery, and whether alternatives to surgery should be considered, depends on many factors including the location of the tumor, the stage of the tumor, general health, and much more. Since every person is different, it's important to be your own advocate and talk to your doctor about the advantages and disadvantages of each treatment with regard to your unique tumor. Studies have found that people who have surgery for lung cancer at cancer centers who perform larger volumes of these surgeries tend to have better outcomes, so it's important to choose a good lung cancer treatment center and consider a second opinion before making your decisions.